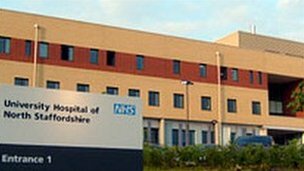 It brings the total number of people being treated at University Hospital of North Staffordshire to nine, all aged between their late 40s and mid 70s. The Health Protection Agency (HPA) is looking into two cases that were identified earlier in the summer as it is believed they may be linked. The HPA also said it had disinfected seven cooling towers in the area as a precaution. The agency has been working with the Health and Safety Executive, the NHS in Stoke and the city council to try to identify and control any possible sources of the disease. Prof Harsh Duggal, director of the Health Protection Unit in Staffordshire and Shropshire, said: "Early microbiology typing results back from the HPA laboratories show that samples taken from some of the patients look very similar so far and this is consistent with the cases having caught their infection from the same environmental source. "We are taking detailed histories of the movements of the patients to see if there are similar patterns which would indicate a local source of infection. Healthcare staff in the areas where the patients live have been alerted to look out for symptoms. Officials have said early signs include flu-like symptoms, with muscle aches, tiredness, headaches, dry cough and fever which can lead to pneumonia. Diarrhoea and confusion may occur, as well as chest and breathing symptoms. The disease can be effectively treated with antibiotics.